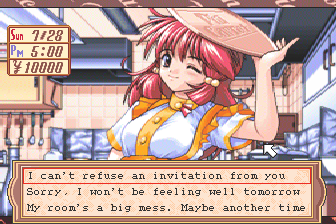 Welcome to Pia Carrot is a dating sim for the PC-FX. 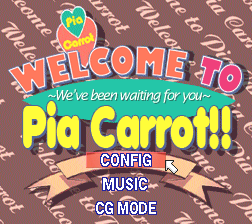 Welcome to Pia Carrot is a much beloved ADV/dating sim/visual novel style game with full voice acting and multiple endings. It was released for PC, NEC PC-FX, and Sega Saturn in 1996, 1997, and 1998 respectively in various versions. This patch is an English translation of the PC-FX version and is the result of a lot of hard work. This patch should be fully playable and is being released for the enjoyment of the fans. It has not been fully tested but the game has been played start to finish with at least 3 of the endings. DISCLAIMER: This patch includes some adult situations and language. 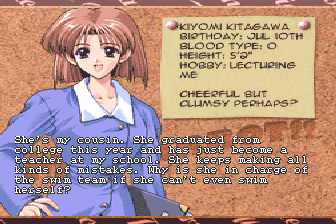 When released in Japan this game was intended for users over the age of 18. Please abide by the laws in your country regarding material of this type. This is a first release and there are some rough edges here and there so please keep this in mind. Minor edits/additions to other things may be made in the future. Please see the readme for more info. Enjoy!